The "Display" settings control the general display format of MultiPing's graphs, including scaling, coloring, and other general values. The legend is shown above the graphs on MultiPing to indicate the range of latencies used for each color band. This legend is automatically hidden if there isn't enough space for it. Turn off this option to never show the legend. Changing these values sets the Green / Yellow / Red threshold for the graphs. This is dependant on your expected performance. For a modem, 200 ms might be quite good, while for a T1, it could be considered bad. When examining current data, sometimes its handy to graph the most recent sample collected. Turn this on to see that. Normally, setting the graph scale to automatic works pretty well. Sometimes, you might get a few samples *way* out of range, though, that stretches the scale. This is especially likely as you increase the value for samples to include. 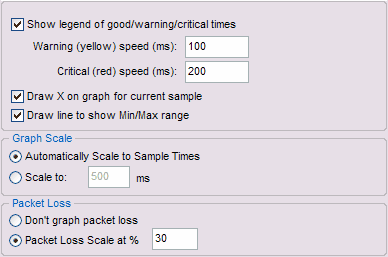 Most often, graphing the packet loss is a handy, easy way to see lost samples. 30% seems to work great for highlighting just the right of loss in most cases, but you're certainly going to run into cases where you want to change this to something lower (as low as 1) or higher (any number is valid - even over 100).